Description: Chaynes' works tended to be inspired by extra-musical objects although here, the Visages are an odd little funhouse mirror trip through Bach's Brandenburg Concerto No. 3 while a poem by Jacques Prévert inspired the other. Freely tonal, alert to interesting scoring and sound combinations, they are quite approachable for moderately adventurous collectors. 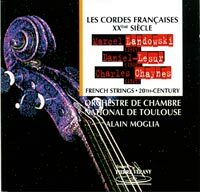 Landowski is rather more traditional in style while Daniel-Lesur is firmly in the tonal, lyrical and melodic tradition of the string serenade genre. Toulouse National Chamber Orchestra; Alain Moglia (violin). 1998 release.